Regular use reduces hair fall and controls dandruff. Free from alcohol and chemicals. 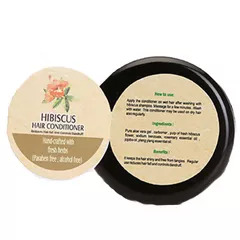 Apply the conditioner on wet hair after washing with URVIJA Herbal Hibiscus shampoo. Massage for a few minutes . Wash with water. Handcrafted with fresh herbs, cruelty free, palm oil free, paraben free, alcohol free. It keeps the hair shiny and free from tangles. Regular use reduces hair fall and controls dandruff.